Thank you Tammy! I love your recipes! Can't wait to try them! I love making these cookbooks! I have many! JAP does them, we make no money for them. They cost me about $25 a piece with shipping. I buy everyone I make. I have this one on the way! Could you tell me who publishes your cookbook for you? Thanks! Thank you Tammy for adding 2 of my recipes. You picked 2 of my favorites to include. Thank you for the great recipe Hannah! I love squash and my daughter is vegetarian and will love it! Love your recipes Rose! Those recipes are the bomb!! Can't wait to try them!! And thank you for liking this book! I have already ordered it! Thank you for adding my recipe! 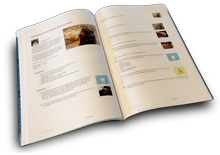 Thanks so much Tammy for including 2 of my recipes in your cookbook. You did a great job by the way. There are so many wonderful recipes that I would love to try. Great Job and great book. Thank you Elizabeth for the wonderful recipe! Can't wait to try it! Thank you for including my Slow Cooker Mississippi Roast! Once it is published, it can not be changed. I did order the book so I will just make a note in it when I get it. Thank you for the heads up! And thank you for the recipe! You used my recipe for Heavenly Chicken Enchiladas on pg 59. That's great. I suggest you go back and get the corrected version of it. I saw just a few minutes after posting it that there was a typo. It says four tortillas in one and four tortillas.... It should be "flour tortillas in one and corn tortillas in the other."